I’ve been saying for a while now that There’s just something about Memphis. It’s real. It’s got stories. It’s got soul. Cliches maybe, but true. A feeling of being captured by something greater than the sum of its parts. You feel its soul all around, in the obvious places and in the unexpected. In pubs and bars and restaurants all over the city, it’s not just the music itself that touches you, it’s how every musician’s cords and beats and rhythms seem to flow from Memphis history, that what you’re hearing is mixed from everything that came before it. And it’s not just that the food that is so damn good, it’s the love and tenderness and lineage poured into every mix, spatula flip and dip into the hot oil. And it’s not just the buildings. It’s the hands that built them. The care and craftsmanship that went into each brick. And it’s the lives that lived in them. Their stories. Their lives, their deaths. My grandmother worked there. My uncle built that building. My grand-dad worked on that railroad. I grew up in that house. The soul of the place, dripping from everywhere you look, grabs you and doesn’t let you go. I discovered a few of those spirits in the two houses I explored for this post. Two houses along the north side of Madison, one house many of you may be familiar with - 2282 Madison - and another that many of you have passed by but never noticed: 2234 Madison. Two addresses east of Cooper, in the neighborhood of the former town of Lenox, in the old Coles East End Subdivision. Starting down the north side of Madison from East Parkway, the first house one sees is not Howard Hall but the W.J. Crawford House (after original owner West J. Crawford, from Mississippi). It's the large, beautiful, red-brick and white-trimmed - get out your architectural guides - “Neoclassical” Greek (or Colonial) Revival style house on the corner. This stately house, set back on an elevation and behind an iron fence atop a low brick wall, actually faces East Parkway - it carries a 1 East Parkway North address - and I won’t be spending too much on it in this study, noteworthy as it is. But don’t forget about it just yet. However, the year of the Crawford House construction is worth discussing because it applies to 2282 Madison as well, as both were likely built between 1910 and 1913. Why likely? Well, the official city property assessment records indicate a year built of 1925, which historically-speaking does not add up. The architectural style, city records, various unofficial sources, etc., point to a construction year of something after 1910 and before 1915. But those city property records stamped with that 1925 date? Well, every house but one of the pre-1930s houses on this particular square block are recorded with a Year Built of 1925. I’ve asked around and checked various city archives and have yet to find out why 1925 in particular is listed, although it is possible that it may have something to do with the fact that 1925 is the year that the Shelby County Board of Adjustment was created and would have begun keeping records. The BOA as it’s called hears and approves requests for building “variances” under what is called the Unified Development Code. Either way, recording errors such as those for 2282 Madison, though rare, exist in official property assessment records, especially in newly annexed townships in the early century. And correcting those errors? It’s an administrative nightmare, requiring the kind of documentation and building records that may no longer exist, or that are disintegrating in the bottoms of boxes in house attics or basements. 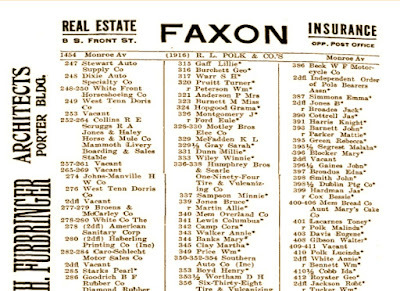 Finally, a thorough (and exhaustive) search of old Memphis city directories from 1909 to 1915 tells us that in 1911, there was no residence at 2282 Madison. 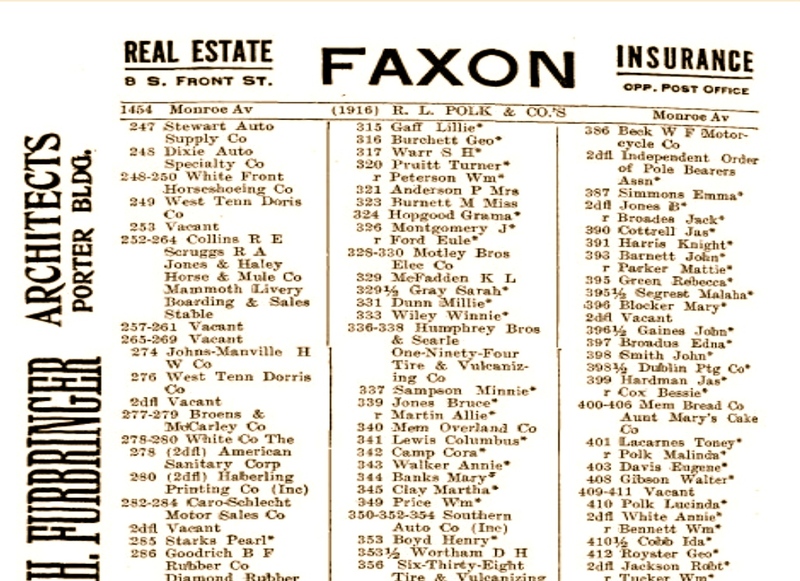 But by the May 1913 publishing of the 1913 Memphis City Directory - which reflects 1912 businesses and residents, their addresses and early telephone numbers - there exists a resident at a house at 2282 Madison Avenue. That resident? A Mr. Caruthers Ewing, a lawyer who worked Downtown at the Memphis Trust Building, now referred to as the Commerce Trust Building. Caruthers Ewing was in his early-forties when he built the house that stands at the corner of Madison and N. Edgewood. (Edgewood north of Union was in the 1910s called Lenox Avenue.) Mr. Ewing was an attorney who moved down to Memphis from the city of Dresden, in Weakley County in northern Tennessee, about 15 miles from Kentucky. The house itself, on about three-quarters of an acre, two and a half stories of eight bedrooms, four full bathrooms, can best be described as “Eclectic,” a term used to describe architectural styles that are literally a creative mix of influences. 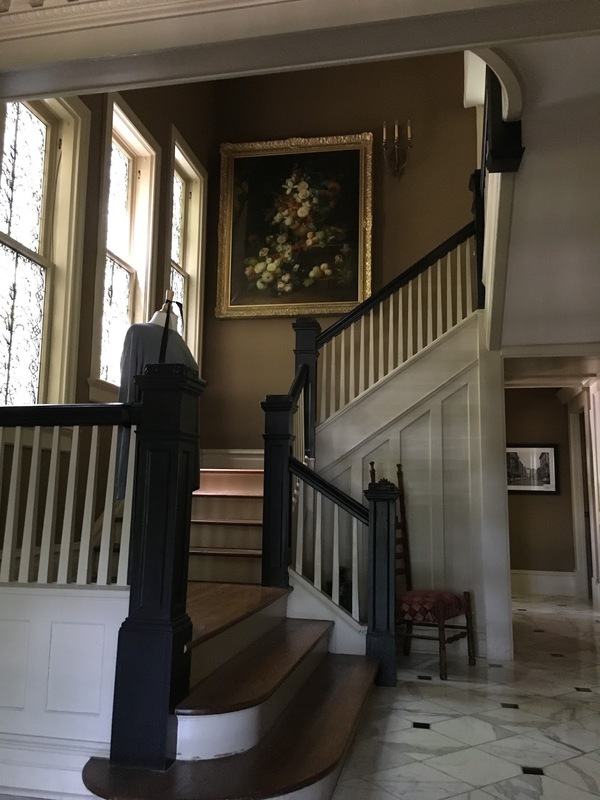 Overall, the house fits the mold of the Colonial Revival style, so named for the “rebirth of interest in the early English and Dutch houses of the Atlantic seaboard,” as quoted in McAlester’s guide. It was the most popular architectural style in the early century all over the eastern states and in the South. If you’re not schooled in architectural styles of the American house, you can identify many Colonial Revival houses of the era by a triangular “side-gabled” roof on each end, asymmetrical design, a decorative entrance, and for some houses, a one or two-story side wing or garden room. However what’s interesting about Howard Hall is that it has architectural touches beyond straight-forward Colonial Revival - I almost sense in it a little flavor of the French Eclectic style that was just beginning to take root, and the stucco siding versus the red brick of many Colonials (which also happened to be more expensive at the time - the original architect could not be reached for comment). And finally a feature that is seen all over early-century Memphis, the familiar porte cochere (pronounced port-ku-sher), the covered entrance for horse and carriage access, or motor cars years later, that is accessible from Edgewood via a curving driveway. Once inside, the house’s main entrance hall and foyer greets visitors with the elegance of the era: tiled floors, a grand staircase. The house was Mr. Ewing’s and his wife’s home until into the 1930s, when he and his wife Bessie Winstead Ewing traveled to Europe and then moved to New York. (Census reports into the '40s show that they had a New York Park Avenue address.) And according to Howard Hall’s official history, when Mr. Ewing moved, it was rented in 1935 by a Mr. W.J. O’Brien, who just happened to be the President and General Manager of Memphis Power and Light Company. But when Memphis Power & Light was sold to E.H. Crump in 1939, Mr. O’Brien moved out of the house, and Caruthers Ewing’s son, Caruthers Jr., moved in. In 1965, Dixon Jordan purchased the house, becoming only the second official owner, and upon his death passed the house along to his daughter Jennifer Jordan Eldridge. It remained in Eldridge’s hands until her and her husband sold it to Mr. Hal Bowen Howard, Jr., in 1997. 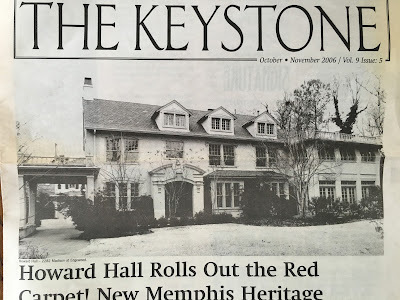 Howard Hall is today the home of Memphis Heritage, the generous gift of Mr. Hal Howard, Jr., born in 1925 here in Memphis. He was last individual owner of the house. But Hal never lived in it. He bought it for his second wife, Suzanne, making some renovations for her in hopes that she would eventually move into it. But sadly, his wife never moved in. He also had great sentiment and affection for Memphis and its history. And since his wife Suzanne wasn’t going to live in his house at 2282 Madison, he decided to give the house a different life. “Tell me about Memphis Heritage,” he said in 2005 over a phone call with June West, Memphis Heritage’s Executive Director. And as June tells it, she was floored. 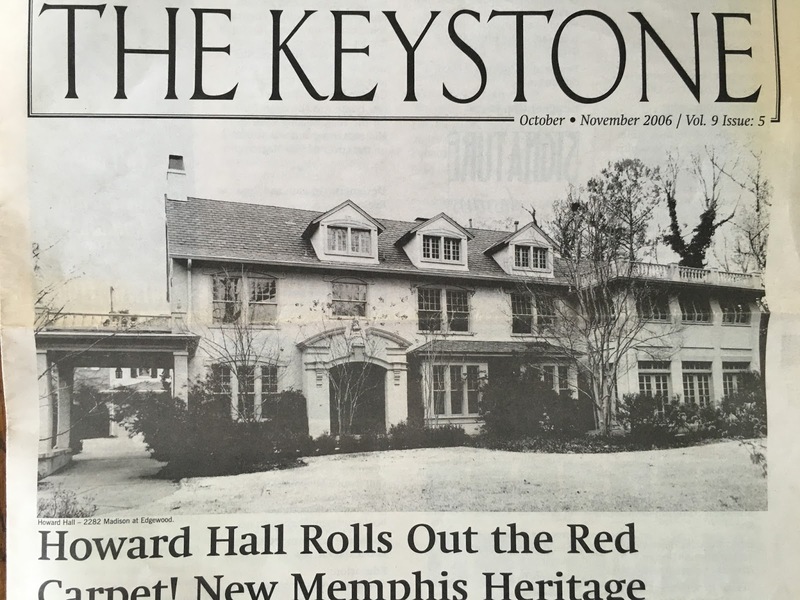 In 2005 she and the MH board had been in search for a new home for the organization, and Mr. Howard’s house seemed a perfect fit. But months went by with no word from Hal, and June gave up, thinking that this wealthy man had forgotten about their conversation. He hadn’t. Months later she received an envelope from Paris, and a hand-written letter from Hal himself, declaring his intent on donating the house to Memphis Heritage. Hal Howard Jr. passed away Feb 26, 2015. His obituary mentions his life in New York, his travels, his family lineage, his philanthropy, as well as his sentiments for Memphis. 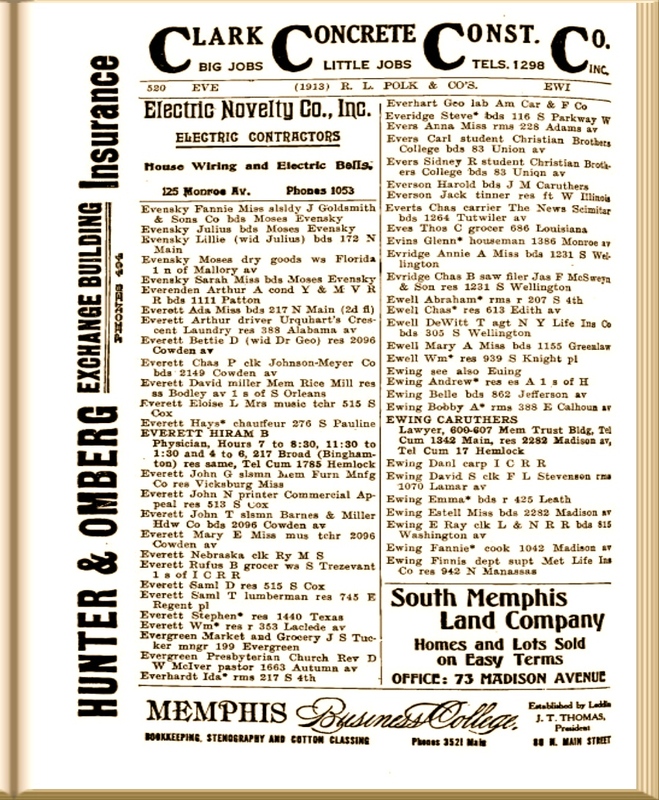 So sentimental was he that upon transferring ownership of the house to Memphis Heritage, he had the deed written so that if for whatever reason MH had to resell the house, that it would be sold as a residence, insuring that future Memphis families could enjoy it. Our story could end here, as Hal’s donation to Memphis Heritage has been fruitful for many, and his legacy is intact. But after a tour of the upstairs of the house, Ms. West showed me the only “working” sleeping quarters in the house: the upstairs bedroom that is furnished as it was when the house was still a residence - the rest of the house is used for offices, storage, conference rooms, and the occasional party. It is the W.J. Crawford Room. Now used for out of town guests of Memphis Heritage. And W.J. Crawford? He happened to be Hal Howard Jr’s grandfather from his mother’s side, Marianne Crawford Howard. And remember the Crawford House at 1 East Parkway North, right next door? W.J. was the original owner that house. 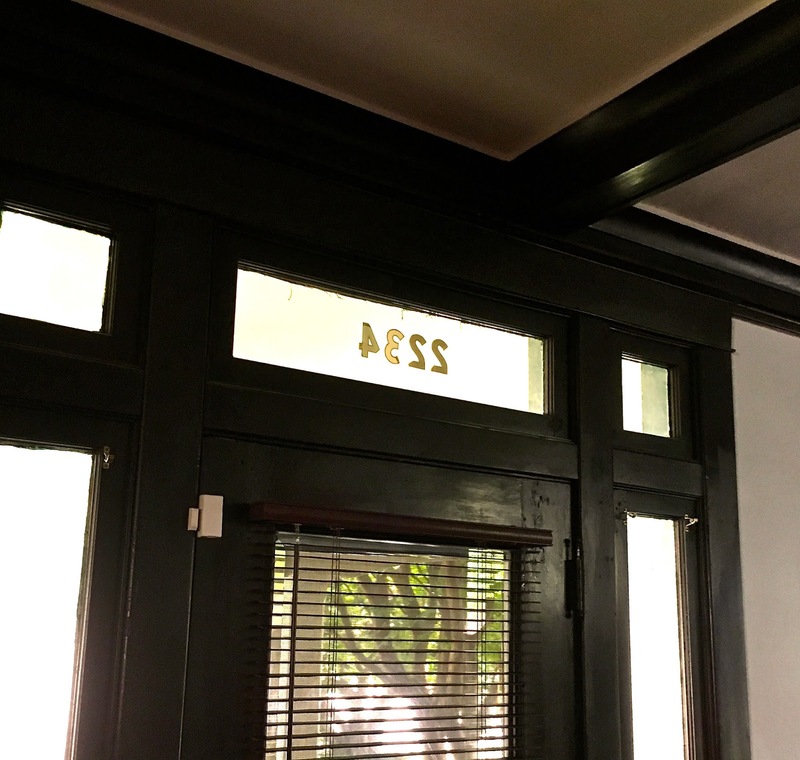 And so the ghosts and legacies of this little corner of Memphis’ history come full circle. 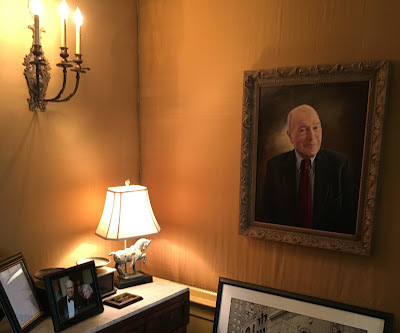 Well, maybe a circle outside of another circle, because as serendipitous as the story of the Crawford and Howard houses are, another remarkable little synchronicity occurred around this house, and this room, in the winter of 2015. Meet Wanda Wilson. I will inevitably share a lot more about her later in my journey, but there are many a Memphian who know that name. She was the owner of the P&H Cafe - also on Madison, between McNeil and Willett and across from Minglewood Hall - but she was no ordinary owner. Hearing people talk about her makes one wish you had known her. 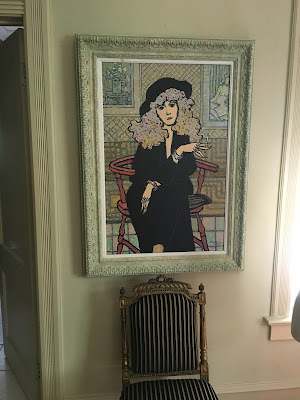 The Flyer called her the Midtown muse, and she reminds me of a New York icon by the name of Elaine Kaufman, who presided over her own legendary hot spot Elaine’s for over fifty years on Manhattan’s Upper East Side. Wanda held court at a far end of her bar, she inspired people, she dispensed raw tart-tongued advice. The CA’s John Beifuss, in his obituary for her, said she was “the patron saint, den mother, confidante and muse for the generations of artists, politicians and journalists.” She passed away in late January, 2015, one month before Mr. Howard. 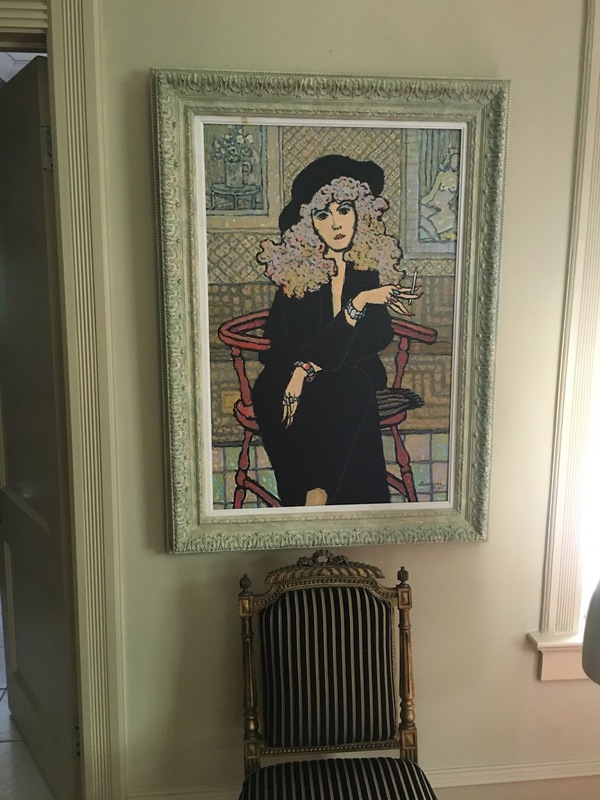 The portrait you saw above was “her Stevie Nicks look,” and it was painted by legendary Memphis artist Paul Penczner (1916 - 2010). It is one of two portraits of Ms. Wilson that are now in the Crawford bedroom. And in late January 2015, an actor by the name of Jerre Dye was in Memphis for his stage role as Dr. Frank-N-Furter for the Playhouse on the Square’s revival of The Rocky Horror Picture Show. A friend of June’s, Jerre had been staying in the Crawford room while in Memphis. He was in the room the very night Wanda Wilson passed away. As June tells it, “he definitely got a chill when he heard the news,” her image looking right back at him, as though her spirit had made a passing visit before moving on. Another spirit. Another life in another house along Madison. One of many I will encounter along this journey. 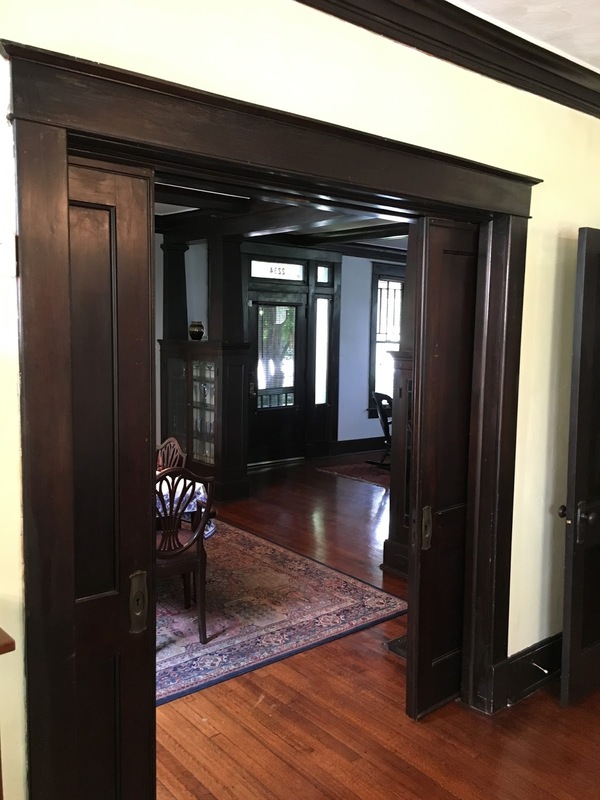 Shelby County property records indicate the house at 2234 Madison Avenue was built in 1915 (however in the 1914 City Directory there is already a listing at 2234 Madison). It is a two-story (plus third-floor attic) house, in the American Four-Square Prairie-style common to the era. Prairie-type houses are one of just a few that were not revivals from any European styles; they truly are American originals. Most were built in the ten years before World War I.
squared design featuring four primary front windows. as the fourth house from the corner. 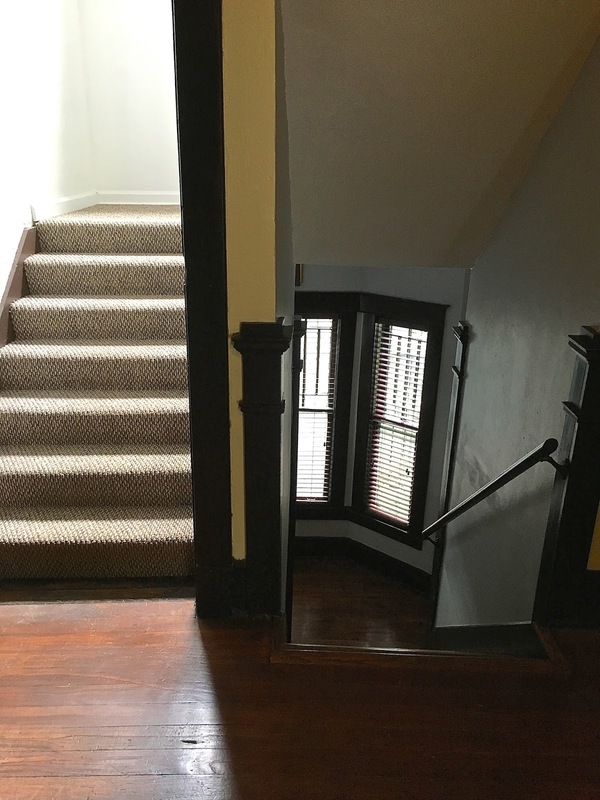 It’s notable in looking at the map that in 1927 we can see the outside stairs in the back of the house that lead to the upstairs rear residence. The garage in the backyard has since been torn down. Susie Ratner and her partner Claire Ryan have lived in the house at 2234 since July of 2002, when they bought it from the McGuire Construction and Investment Co. They are but two of many Memphians who have resided at 2234 over the last one hundred years. As noted in the 1915 clipping, (L.J.) Turcott and his wife Sallie hosted the wedding of their daughter in the house at 2234, giving away in marriage their daughter Addie Hampton Hay to the tall, blue-eyed and red-haired William Maydwell McNeely. There were professional pictures taken at the ceremony and reception (those portraits are part of the family’s private collection). Mr. Turcott hailed from Canada. He worked as a blacksmith and in 1915 his work address was 453 Monroe Avenue. Good luck finding #453 today, but in those days that address would have been on Monroe somewhere between Lauderdale and Marshall, across the street from and near where the High Cotton Brewery is today, and just a block over from the now-empty Wonder Bread Bakery building. Now Mr. McNeely, his new son-in-law, was a bookkeeper in 1915. But in 1917 his vocation is listed as a bread salesman, and his work address was none other than 400 Monroe, just a block or so away from Mr. Turcott’s work address. The streets around Monroe and Lauderdale and Marshall were thriving and busy in those days, and those of you who know your Memphis addresses may recognize 400 Monroe as the address of the very same Wonder Bread Bakery. Wonder Bread the bread mill and factory wasn’t built until 1921, but from the early century until 1920 that address was the home of the Memphis Bread Company, and for a few years also the home of Aunt Mary’s Cake Co. I have no access to private family history, but it’s fun nonetheless to speculate that after William McNeely married L.J. Turcott’s daughter Addie, Mr. Turcott, in knowing many business owners in and around the blocks near his blacksmith shop on Monroe, may have had a hand in getting William a job as salesman. One can imagine the exchange, soon after their wedding, Mr. Turcott’s arm around William, asking “Son, ya gonna be a bookkeeper all your life? How’d ya like to try your hand at sales? I know a few people at the Memphis Bread Company, and they could use a young salesmen like you.” William wasn’t all that young in 1915 - he was already 27 - but it’s easy to imagine such a conversation. These were among the first events in the one-hundred-year-old house at 2234 Madison. 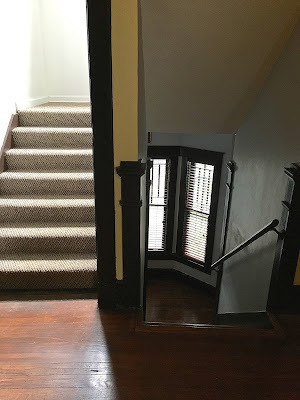 And based on the use of the house for the 60-plus years that would follow, it’s evident that the McNeely newlyweds used the upstairs as their residence - through the 1980s the third floor attic had a full bath and a kitchen - and in 1916 the McNeely’s bore their first child in the house, daughter Addie Lucille. The Turcotts and the McNeelys weren’t in the house for long. By 1918 the Turcotts were out, having moved to Angelus Street in the Evergreen neighborhood, as were the McNeelys, who by then lived at 357 North Lewis in North Memphis. William and Addie would have another child there, in October of 1918, a son. According to records, their son William M McNeely, Jr. was nicknamed “Little Bill.” And at barely three months old, on Christmas Eve at eleven in the morning, Little Bill succumbed to a bout with the influenza that was so common in the day. The death certificate indicates that there were visits by a physician each day for three days until Little Bill passed on one of the most sacred days of the year. One can only imagine the family’s pain amidst the joys of the Christmas season, a grief no parent could ever forget. William McNeely would later serve in the U.S. Coast Guard during World War II, as a Lt. Commander in his mid-50s no less, and would pass away in 1957 at the age of 68. His wife Addie would live until the age of 78 with her passing in 1974. But the place in which they exchanged their marital vows will always be 2234 Madison Avenue. The house would have many residents in the years following the Turcotts. From 1918 to 1923, the house was owned or more likely leased to a Mrs Ida V. Cummings, an F.M. Longley, a J.J. Elvert for three years, and finally to a Eugene Skillern before being sold to a Mr. Guy Smith McClellan and his wife Nellie. Mr. McClellan was an an insurance agent, and he passed away in 1926. The widowed Nellie kept the house and from 1926 until past 1943 she rented out the back of the house to at least three residents, including a Samuel Jones in 1928, a John Connelly from 1930-34, and a Mrs. Sarah H Berry from 1936-38. After the 1940s Nellie McClellan sold the house. 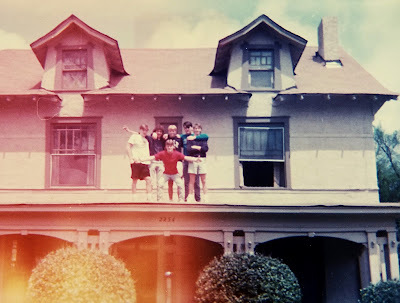 Fast forward to the 1980s (other owners from the 50s to the 70s are unknown as of this writing), when it was owned by a James W Lester Jr., and the upstairs and back was still in use as a rental. When Claire and Susan bought the house in 2002, however, having adopted children of their own, the couple had the house and upstairs renovated back to a single family use. Their only other major renovation was the library fireplace, which required a bit of a painstaking restoration. When I visited Claire and Susan back in June, I had noticed a For Sale sign out, and eventually I asked why they were selling a home that they obviously loved so much. I won’t reveal details here, but like so many of us, eventually life and ailments take hold and walking up two flights of stairs day-in and day-out becomes a painful and dangerous chore. And I could tell by their demeanors that though quite saddened over having to move, they had come to accept that it was time to live in a single-story house. I left that day feeling like I had gathered just enough of a story from these the sweetest of ladies and their lovely home. But a few weeks later I realized I had forgotten a key question, and reached back out to both of them. “Do either of you feel any connection to the original or prior owners of the house?” I asked. “We do, in fact,” said Claire. Over Labor Day weekend the summer they moved in, they had had a house warming party and got to bed late, after midnight. They were in bed in the back of the house in the upstairs master bedroom, their daughters in the front bedrooms. Around 2am they were both awakened. They became frightened. “We could all hear someone walking upstairs” on the third floor. They quickly gathered their girls, grabbed the house phone and their dogs (who were in crates), and hid away in their car to call the police. The police found nothing. No signs of forced entry, no one outside, and no one walking around and playing with a football upstairs. With my research I knew a few things. And I knew that original owners Mr. and Mrs. Turcott moved from the house around 1918. 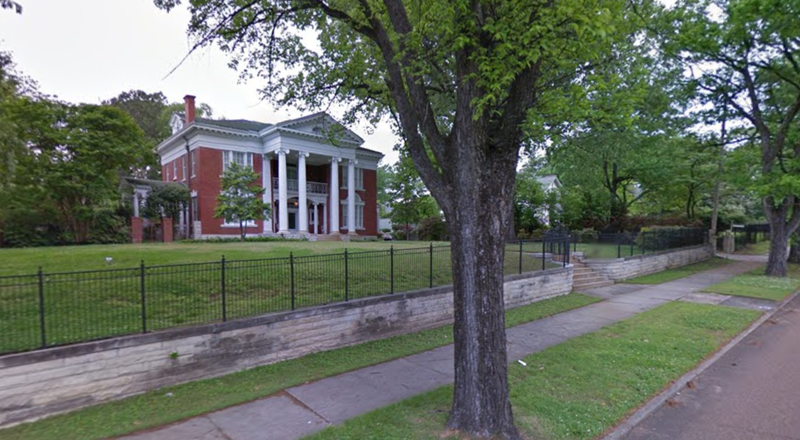 The McNeely’s baby boy died in 1918 up at 357 Lewis in North Memphis. And though there were gaps in the deeds records from the 50s through the 70s, I could not uncover any evidence of anyone dying in the house. Until I dug deeper into the City Directory of 1927, when the McClellans lived in the house, and noticed a “wid Guy S” after Nellie’s name - “wid” for widow. I dug deeper. Mr. Guy Smith McClellan died on August 24, 1926, of cancer to the adrenal glands. He was just 47 years old. And place of death? The County of Shelby, Memphis, Tennessee, 2234 Madison Avenue. The poor man had died in the house. We don’t know exactly which room. But if you recall, his widow Nellie kept the house and rented out the rear of house to at least three residents until a few years past 1943. And it was the upstairs rear of house where Claire and Susan had heard those footsteps. Yet another way in which Memphis has that something. Its heart. Its redemptive soul. Before I finished my chat with Claire and Susie, they revealed that years earlier they had passed up an opportunity to live elsewhere. “Why did you stay?” I asked. Susie looked at Claire, then looked back at me. “Because Memphis needs me,” she said. And so do, I think, its ghosts. Please contact me if you have any additions, or corrections. Special thanks to June, Claire and Susan for their time. 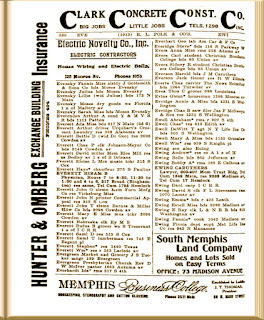 Thanks as always to the Shelby County Archives, the Memphis Public Library, and the Shelby County Register of Deeds site for references in this post. I love this place. I had an event here back in May last year and I felt like it was a perfect day for us! The venue Houston TX provides you with an event Specialist as part of your package which is extremely helpful. Plus all of us dressed up only added to the entire ambience. You had an event at this house at 2234 Madison?